The Royal Opera House in London is a stunning building situated in the Covent Garden area. A world-renowned opera house, it is home to the Royal Ballet, the Royal Opera and the Royal Opera House Orchestra. The current building is the third opera house to stand on the site. The ill-fated first opera house was opened in 1732, but later burned down in 1808. Reconstruction began immediately and the second Opera House was completed in 1809. However, the Royal Opera House suffered once again from the tragedy of fire in 1856. The current opera house was opened in May 1858 and proved to be a huge success. In the 1990s it benefited from a complete reconstruction. 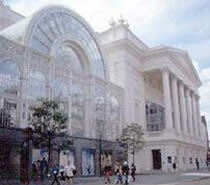 Consequently, it is now claimed that the Royal Opera House is the most modern theatre facility anywhere in the world!